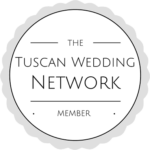 Are you dreaming of having a wedding in Tuscany? Look through some of the galleries of photos of our recent weddings. You can get inspiration for venues and decoration and see the fun to be had in this amazing region of Italy. Here you see the wedding day but our event planning has transformed over the years from organizing one-day wedding celebrations to assisting our couples with rehearsal dinners, welcome parties, farewell events, to even up to a full week of activities. We can offer you the local help and experience you need to be able to arrive in Tuscany to spend quality time with your family and friends.